In a unique setting, inspired by the Italian monasteries, the Sigtuna Foundation Hotel & Conference attracts people from all over the world. The creative and peaceful atmosphere that characterizes the place is not easy to describe but all the more exciting to discover. Located in Sigtuna, with only fifteen minutes from Stockholm Arlanda Airport and less than an hour to Stockholm, you are always close to the rest of the world. 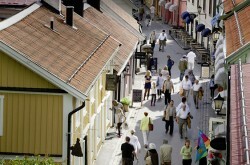 We offer a hotel with unique atmosphere and perfect location in central Sigtuna. All historical sights, shops and cafés within walking distance. Breakfast always included in the price as well as free wifi. We have 62 rooms with a capacity of 92 guests.